The Special of The Day...From the Orange Moon Cafe: "Always Trust"
As mentioned in yesterday's message, I reconnected several days ago with Bud Petty, my Little League baseball coach. I don't participate in Facebook, but I do have a page that I look at a couple of times a year. When I do, I try to find friends in order to find other friends, just to see what folks are up to. This led me to Bud's page, and to contacting him by email. Bud taught me to play first base. The first day of practice, he saw something in me that looked like I might fit in that position. He then taught me the footwork, the positioning, and the old first baseman stretch that enables the player to catch the ball a little sooner in order to beat runners to the base. Bud worked us very hard, and was tough when he needed to be. However, he made the game a great deal of fun, led us to a very successful season, and had three of his players named league All Stars. He then managed the All Star team that won our district championship, and would have won the State and more (we all think) if one of our starting pitchers had not contracted the measles (you don't see that in the Major leagues very often!). 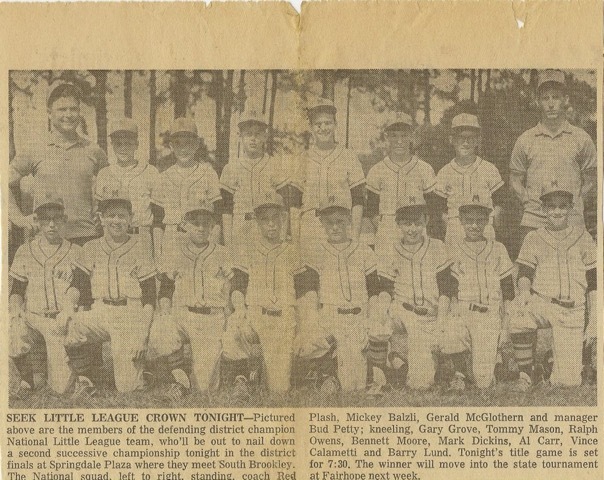 By the way, I've included below an old newspaper clipping from Bud's website in which our team is shown. I'm standing on the back row and to the immediate right of another fine coach and leader of young men, Red Crigler. Interestingly, Dink Hodges, the ace pitcher I mentioned in yesterday's message - the one whose throw almost killed me (!) - is standing next to me on the right. I lost track of Bud after that season. 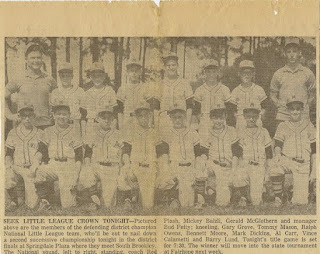 He moved away from our area, but it turns out that he coached Little League for 35 years in various locations. Finding him the other day was a blessing, and even more, he graciously responded to my email. He remembered me and the other two players who made All Stars 47 years ago this summer. That time was one of the happiest of my childhood, and Bud had a lot to do with that being the case. It causes me to wonder how many other young men he influenced during the more than three decades he coached. Nearly fifty years later, I still thank the Lord for Bud, and I have no doubt that I am far from being alone in the grateful remembrance. Bud's life philosophy included on his Facebook page declares, "Always trust in God." Works for me, and for you also, I know. I am reminded of Proverbs 3:5-6: "Trust in the Lord with all thy heart, and lean not unto thine own understanding. In all thy ways acknowledge Him, and He shall direct thy paths." I have no doubt the Lord directed my path back to Bud, nor do I doubt that He led Bud to me so many years ago. Always trust in God. I hear you, Coach, and I'll try to respond to your wise leadership now as I did on the baseball field. Even more. "Oh how great is Thy goodness, which Thou hast laid up for them that fear Thee; which Thou hast wrought for them that trust in Thee before the sons of men!"